This recipe was inspired by my trip to Italy. I ate at this amazing restaurant called Za Za, bought their cookbook that they had at the restaurant and never cooked Italian food the same again. Pasta isn’t the enemy when it comes to healthy eating. Once a week, with fresh, Mother Nature made ingredients is the perfect indulgence. Sneak in some vegetables like spinach and you have yourself a guilt-free, delicious meal that the entire family will enjoy. That’s if you decide to share it. Begin by cooking the salmon. In a medium pan, add salmon and about 1/4 cup of water. Bring water to a boil, reduce heat to medium-low and cover. Once the salmon is cooked, turn off the heat and get ready to make up a delicious bowl of pasta! Cook pasta according to package directions. Reserve about 1/3 of a cup of the cooking water before you drain it. While pasta is cooking, heat oil in a large, deep frying pan. Once oil is hot, stir in the garlic, lemon juice, and spices into the pan. Reduce heat to medium so garlic doesn’t burn. After a couple of minutes, stir in the salmon and flake it apart with a fork. You can make the pieces as big or small as you want. Next, stir in the kalamata olives and cook for another 4 minutes to allow the flavors time to release. Then, stir in the tomatoes, the cooked spinach and boiling pasta water. Bring to a gentle boil and let simmer until pasta is cooked. 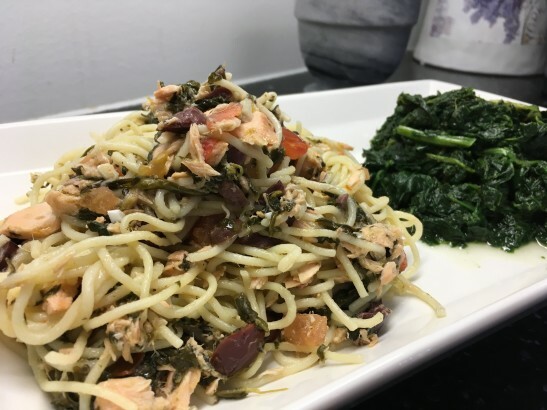 Once the pasta is cooked, drain and immediately transfer to the pan with your salmon and spinach. Toss together until thoroughly mixed and serve. You can even top the pasta bowls with freshly grated Parmesan cheese for a little indulgence.